Bostonian Seafood & Grill, The Langham’s signature seafood restaurant, has established itself as a new social dining hub. Located in the basement level of the five-star hotel, Bostonian features interiors inspired by a shipyard scene with nautical touches and embellishments set throughout the expansive space. The restaurant is divided into three distinct areas, each designed for a different enjoyment—there is a craft brew bar, the main dining space, and even a private champagne room. With cement sand wall finishes and an abundance of industrial-style lights reinforcing the contemporary look of the space, additional design details such as herringbone oak timber floorboards, handcrafted copper and metal furnishings and a collection of contemporary wall art bring uniqueness to the restaurant. The 118-seat main dining area is set with retro mahogany leather banquettes, the prime seating throughout the space, as well as free-standing wooden tables. The private champagne room seats 16 guests, as the room houses labels from reputable vineyards, including the largest collection of champagnes from The House of Lanson. The Bostonian Seafood & Grill menu is designed to impress with a wide range of sustainable seafood and steakhouse favourites. 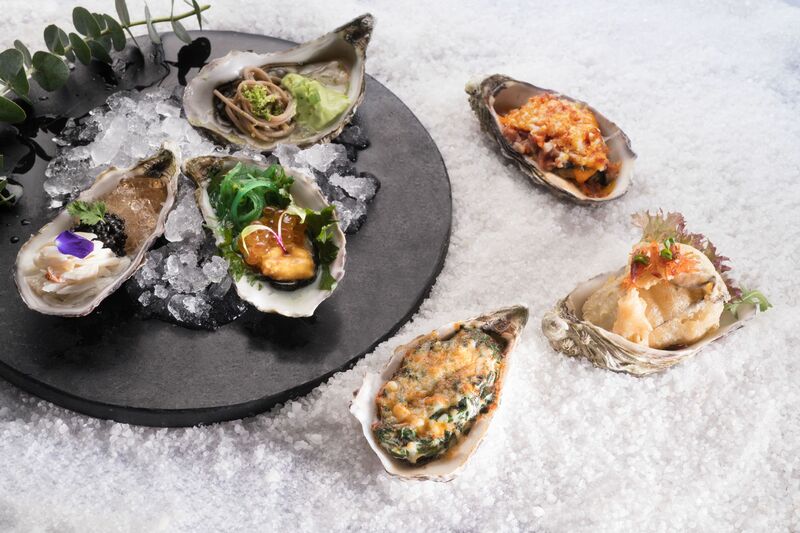 Among the array of signature sharing plates are raw ‘You and I’ oysters, where the raw mollusc is topped with Hokkaido sea urchin, seaweed, sesame and salmon roe, while a baked oyster Rockefeller is stuffed with spinach, béchamel sauce and Parmesan cheese. Other seafood favourites include the Bostonian’s unique seafood tower, showcasing the season’s best ocean harvest such as Boston lobster, oysters, scallops, razor clams, cherrystone clams, and more. The establishment also keeps a selection of steakhouse classics such as the Bostonian lobster bisque, fish and chips, crab cakes, a 12-ounce premium grilled rib-eye steak as well as roasted French organic yellow chicken, and a lobster Thermidor prepared with one-pound lobsters. Save room for dessert as among the Bostonian signatures are a deconstructed banoffee pie featuring a melange of textures where Valrhona Bahibe chocolate mousse meets ganache, and praline financier. The signature baked Alaska spotlights vanilla and raspberry ice cream enrobed with sweet meringue, which is then flambéed tableside with Grand Marnier. Fruit-based martinis are also popular at Bostonian, as guests can enjoy an exotic mix of flavours in martini-form such as mango and chilli, passion fruit, lychee, and a sour appletini as well. Bostonian takes great pride in offering a sharing gourmet dining experience, as party packages are available for private celebrations at the exclusive champagne room, complete with special decorations and birthday cake for a unique experience.